Approximately 75% of all breast cancers fall into the luminal classification and require estrogen to grow. While most of these cancers are treatable with anti-estrogen therapies, some also contain cancer cells that do not need estrogen and are resistant to these therapies. Dr. Kathryn Horwitz’s laboratory focuses on the hormones estradiol and progesterone and their role in breast cancer. Since physicians identify different cell populations in breast cancers to prescribe combination treatments, Dr. Horwitz has been studying some of these cell populations. Her research showed how combination anti-hormone and anti-growth factor therapies can efficiently suppress multiple cell populations. Dr. Horwitz is also studying the problem of tumor dormancy as luminal cancers often recur many years after initial diagnosis and treatment. Her research has shown that dormant or “sleeping” tumors can be “awakened” by hormones. Thus, her team is continuing their studies to better understand the significance of cell subtypes in luminal cancers, their role in initiating tumors and in spawning dormant mini-tumors at metastatic sites, and the roles of estradiol and progesterone in tumor arousal and recurrence. This work may also have a strong influence on the understanding and treatment of other hormone-related cancers, such as uterine and prostate cancer. Dr. Kathryn B. Horwitz, Ph.D., is a Distinguished Professor at the University of Colorado Medical School. She attended Barnard College for her undergraduate studies and UT Southwestern Medical School for her graduate studies. After completing her postdoctoral work at UT San Antonio, Dr. Horwitz joined the faculty at the University of Colorado. 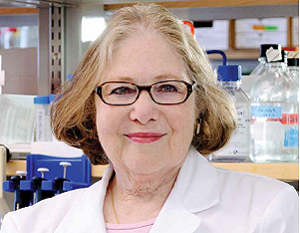 She has received many awards and honors throughout her career, including the National Cancer Institute’s Rosalind E. Franklin Award for commitment to cancer research. Dr. Horwitz was elected President of the Endocrine Society and received its Fred Conrad Koch Award for exceptional contributions to endocrinology. Additionally, as a well-known national and international scholar, she has served on multiple society boards, study sections and editorial boards, and she has mentored numerous trainees who hold senior faculty posts at many U.S. medical centers. Dr. Horwitz’s lab has been supported by grants and fellowships from the National Foundation for Cancer Research, the Avon Foundation, the Breast Cancer Research Foundation, the National Cancer Institute of the National Institutes of Health, the Komen Foundation and the Department of Defense. Your ticket for the: Kathryn B. Horwitz, Ph.D.